It’s been about five days since 24-year old Dustin Johnson coughed up an 82 after being the 54-hole leader at the United States Open at Pebble Beach. I waited five days to touch on it for a reason. Because I guarantee you that, in every waking hour since his melt-down, Johnson has thought about it. Some hours, he thought about it a lot. His 82 was the worst final round by a 54-hole leader in 99 years! And that’s why golf is, without a doubt, the toughest sport for any individual to excel at. Incredible collapses happen in sports every so often. In this year’s Stanley Cup Playoffs, the Boston Bruins became just the third team in Stanley Cup history to blow a three-game series lead in a best-of-seven. In their case, there are about 23 guys, and a handful of coaches, who can discuss and emote what befell them with each other. Ditto Italy, after being stunned by Slovakia at the World Cup of Soccer. Dustin Johnson is all alone. Oh, he has a coach and a caddy and family but, on that Sunday at Pebble Beach, when it was coming completely apart, Dustin Johnson was all alone. He was the only one swinging the club. He was the only one watching his triple-double-bogey, front-nine stretch from the inside. And that can mess a golfer up for a long, long time. Several years ago, I was in muggy Victoriaville, Quebec, working at a Canadian Tour event. A 30-year old Kentucky native, Phillip Hatchett was on his way to victory. But, on the ninth hole, he missed a ridiculously short putt – maybe 14 inches. After the round, I asked him about the putt, and how he could possibly have missed it. He hung his head and muttered, “I had a bad thought.” It was that simple. Nothing more. Golf is executed with actions, but it’s played in your head. And Dustin Johnson’s head played a very, very bad final round. Jack Nicklaus is proud of saying that he never remembers missing a putt of any consequence on the 72nd hole. Oh, he missed several of them…but the key is that he doesn’t “remember” them. 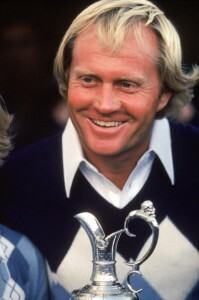 And that’s why Jack Nicklaus is Jack Nicklaus. He is one of the few who can seemingly control what goes on up there. Will we ever see Dustin Johnson in the 54-hole lead of a major championship again? Not likely. Like Scott Hoch before him, Johnson likely knows that was his one chance. At least, he’s probably thought about it. And, once you start thinking, you’re a goner. Right, Dustin? A PGA and Green Jacket could be in his future yet. And I thought his approach to 18 on Saturday took huge onions. He had a big lead (obviously not big enough) and wiser heads may have layed up, he attacked and executed…very impressive, I thought. BTW: Mike, Ian, Retief, and Camillo all privately ripped the greens at Pebble. Not the speed, just lack of “trueness”. Hang the sign. Do you know why Saturday is Saturday…because it’s not Sunday. Hang the sign. Hey, it’s not as if Jean Van de Velde never went on to do great things…oh, wait. Hey there! I’ve been following your site for some time now and finally got the bravery to go ahead and give you a shout out from Kingwood Texas! Just wanted to tell you keep up the fantastic job!